Mining is one of the oldest, yet still relevant industries that exists. Although seldom thought of or considered as it relates to our day-to-day life, the industry remains a pillar of today’s society as we rely heavily on raw materials for housing, infrastructure, and manufactured goods. 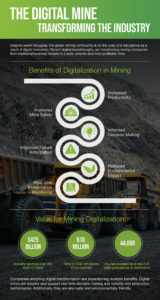 Fortunately, the industry itself is already embracing the 21st century, thanks to a paradigm shift towards the application of technology to improve operations and progress towards a connected “digital mine” that operates at the pinnacle of safety and efficiency. 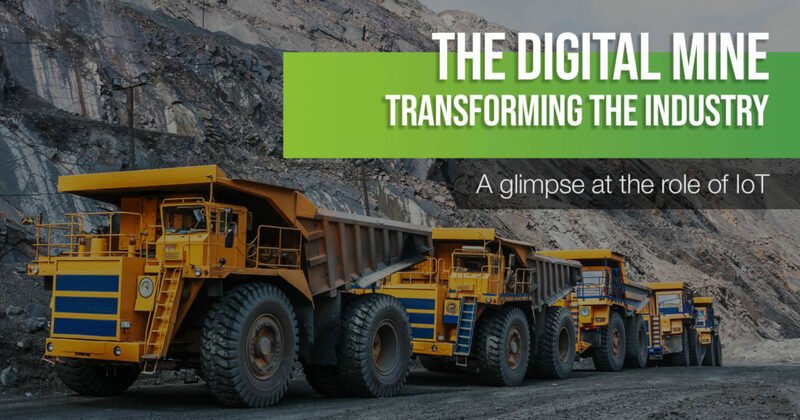 One of the key technologies providing the framework for connecting the mine site, is the Internet of Things (IoT). Because this progress is happening so rapidly and because it’s having such fundamental effects on mining as a whole, we decided to take a closer look at the potential that the IoT will have on the industry. Here’s what we discovered. Because the internet of things can be made up of a variety of independent parts and components, it can be challenging to take a step back and appreciate the wide-ranging aspects of a mining operation that it can meaningfully improve. However, once you get an idea of what’s possible, it’s easy to see why it’s so transformative. Here are a few examples of the improvements offered by the IoT. One of the primary reasons why mining companies are embracing internet-connected devices is that everything they do can be prohibitively expensive. Although mining accounts for hundreds of billions of dollars of earnings around the world, many of the day-to-day operations can be exceedingly costly and wasteful if a company isn’t prepared. A critical stage of mining occurs well before ground is broken. Early in a mine’s lifecycle, getting sign-off from permitting agencies regarding the operators’ responsibilities as well as compliance management activities to minimize environmental impact are critical. Implementation of environmental sensors save time and money by providing insight on potential environmental impact, data on potential risks and outcomes, etc such that appropriate permitting, staffing, and procedures are implemented. Having a comprehensive picture of everything that’s happening on site is crucial and invaluable for both exploration and operation because they can make decisions and adjust their plans in real-time. Today, mining is much safer than it’s ever been before. Historically, injuries and workplace accidents were much more common, partly because safety regulations didn’t exist and because operations were much more focused on results, not what it cost to get them. However, even with great strides in operational safety, deaths and serious injury can still occur. Thus, it’s imperative that companies have timely information exchange and controls to manage their work environments as safety-consciously as possible. Fortunately, IoT is making this possible across the project lifecycle – from the planning and exploration phases to operations and remediation. Additionally, automation is allowing the industry to reduce workers exposure to unsafe work environments. Here are a few ways that safety is easier to manage than ever, thanks to the IoT. Planting sensors in and around the mine can help management monitor the area for any potential hazards that may arise. Whether it’s loose soil that can lead to a rockslide or severe weather conditions that can make the site unsafe, these sensors provide invaluable insight into what’s happening on the ground. Because all of these sensors can be connected and monitored remotely, it’s much easier for companies to anticipate problems before they arise. If sensors are showing some potentially disastrous situations, they can adapt operations to avoid them or correct the issue before it becomes a significant problem. One of the worst things that can happen on site is a critical machine breaking down. If it happens unexpectedly, it can derail the operations and cost a ton of money, both in lost productivity and the expense of replacing and repairing the equipment. For example, having to express ship new parts to the mine can further increase the costs of breakdowns. With internet-accessible sensors connected to the machinery, however, these problems won’t be as significant as they once were. Now, instead of waiting for something to break, the company can get real-time information about all of their equipment in use and anticipate possible scenarios. Also, seeing the wear and tear of the machinery remotely ensures that operations can order replacement parts and schedule repairs ahead of time. Whenever you mix heavy machinery with people, accidents can happen. Thus, if you can reduce the number of workers working in an unsafe work environment, then the chances of an incident can reduce substantially. When utilizing IoT devices, companies can limit the need for field work therefore reducing exposure to injury. Since you don’t need workers to check sensors or relay data from various potentially dangerous access points, it’s much easier to manage everyone from a centralized station. As we mentioned, mining is an expensive operation. No matter what, the cost of people, equipment, and other operational elements dictates that mines have to operate at peak efficiency at all times. Overall, the central aspect of the IoT is interconnectivity. Thus, pairing these devices with analytical software and functional AI means that data driven insights can be made readily available, and decision making can be decentralized – leading to massive operational productivity gains.. Even better, having access to these tools can also boost profits for these companies. According to a recent report, the mining industry as a whole is set to increase revenues by more than 10% over the next five years, all thanks to the improvements and transparency created by implementing IoT devices. The primary cause of this surge of income stems from the fact that with more efficient operations and safer work environments, mines can increase output and production. As technology progresses, the IoT will only continue to benefit mining companies and operations around the globe. Although these systems are not quite perfect yet, new developments and strategies will ensure that mines can improve continuously. Over time, as operations become more and more efficient, we’ll be able to do more with a lot less.